Daniel Newhard, left, and Eric Fish, recently had research papers they authored selected as award-winning manuscripts by the Phi Zeta Veterinary Honor Society. Research papers authored by two Auburn University College of Veterinary Medicine faculty were recently selected as award-winning manuscripts by the Phi Zeta Veterinary Honor Society. 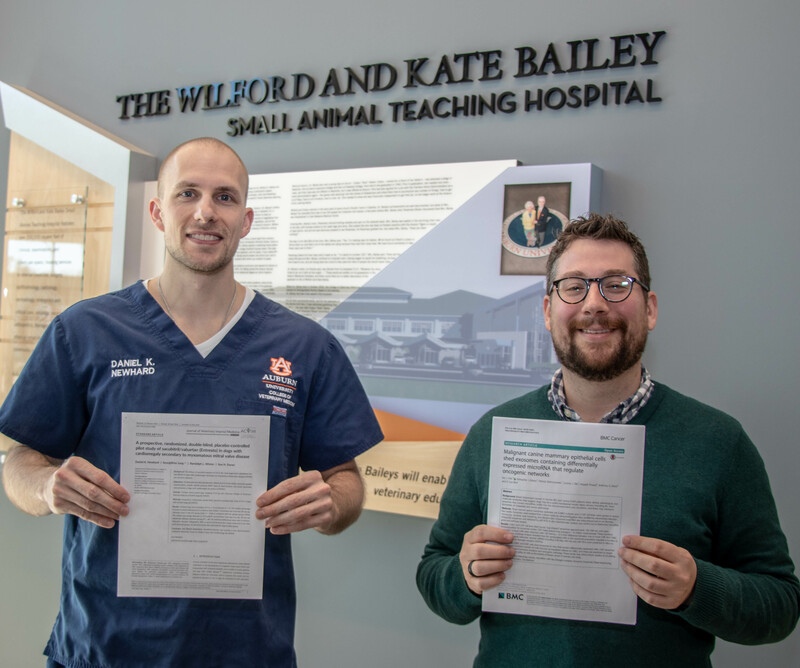 Eric Fish, DVM, an assistant professor in the Department of Pathobiology, and Daniel Newhard, DVM, a cardiology resident in the Wilford and Kate Bailey Small Animal Teaching Hospital, were chosen to represent Auburn’s Epsilon Chapter in the national Phi Zeta Manuscript Award competition. Fish’s paper, “Malignant canine mammary epithelial cells shed exosomes containing differentially expressed microRNA that regulate oncogenic networks” was selected in the Basic Science category. It also was published in the journal BMC Cancer. Competing in the Clinical Science category, Newhard’s manuscript, “A prospective, randomized, double-blind, placebo-controlled pilot study of sacubitril/valsartan (Entresto) in dogs with cardiomegaly secondary to myxomatous mitral valve disease,” was published in the Journal of Veterinary Internal Medicine. “This study was the first to document that canine mammary cells, both cancerous and non-cancerous, secrete small, subcellular fragments called exosomes, and that these are enriched in microRNA, small regulatory molecules that help control gene expression,” Fish said. Newhard’s study evaluated use of the drug Entresto in dogs prior to the development of congestive heart failure. “This study evaluated Entresto in dogs prior to the development of congestive heart failure, but in humans it is used for the treatment of heart failure,” Newhard explained. “We would ideally use this drug to treat congestive heart failure in dogs. ACEi are currently the standard of care in this category of drugs to treat congestive heart failure in dogs. Future studies would compare enalapril (ACEi) to Entresto in the same classification of dogs used in the first study to determine if Entresto is superior to enalapril, as it is in humans (this study would mimic our first study, but instead of placebo, the second group would be an enalapril group. If Entresto is superior, then it can be tried in dogs being treated for congestive heart failure (once again, compared to enalapril). Both faculty are continuing their research. Winners of the national competition will be announced later this spring.